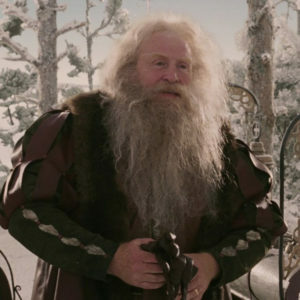 The appearance of Father Christmas in chapter 10 of The Lion, the Witch and the Wardrobe is one of the most unexpected and memorable moments in the series. Both scholars and fans have been discussing the scene for decades. J.R.R. Tolkien felt very strongly that the character did not belong in The Chronicles of Narnia. Listen to this podcast and then post a comment. 1. What was your first reaction when Father Christmas appeared? Did he seem out of place? 2. Answer the “Stump a NarniaWebber” trivia questions at the end of this episode. 3. Give feedback about this podcast! What do you like and dislike about it? What would you like to see more/less of in the future? How/where do you usually listen? This is our last episode of the year! We will be back sometime early next year after looking through your feedback. I always listen as soon as I can when the podcast is up. I like Father Christmas and perhaps one reason Lewis wanted him is to return to the real man and the good Medieval ideas around him of alms-giving and of protecting children. I love that the gifts he gives to the Pevensies are for living real life and for their great need in the days ahead, not for play and self-amusement. Perhaps, the disconnect some Narnia Webbers may feel comes from what Santa Claus has come to be since the Reformation (when the stories and superstitious traditions became suspect). Apparently, people still wanted a gift-giver and so began Kris Kringle and the lot. The best parts of Nicholas can barely be seen now in the commercial, superfluous Santa Claus we know. Some NarniaWebbers might know Dr Michael Ward’s books "The Narnia Code" and "Planet Narnia". Dr Ward believes that Lewis designed each Narnia book to represent one of the seven Classical Planets (gods) and their qualities (all aspects of Christ/Aslan). "The Lion, the Witch and the Wardrobe" is Jupiter: Aslan being "bringer of Joy", the King of Kings, (the Pevensies like 4 Jovian moons!) Everywhere this book is full of Jovian/Jovial imagery. So of course Father Christmas shows up as a big, white-bearded, jolly, fatherly, generous harbinger of the coming of Aslan! Dr Ward believes that the Narnia books were designed with serious discipline — just not the type Tolkien wanted to see! I like Gp’s connections of the ideas of longing and true myths coming together in Narnia generally and in the Father Christmas scene specifically. I can remember being in the theater and thinking "It’s Aslan that let you in, not the kids" during the Father Christmas scene. I don’t think I like the idea of FC in future Narnia movies specifically because he is tied to Christmas and thematically, I can’t think of any reason he’d be around in the other stories. It’s possible he’d be at the Snow Dance (but I don’t think you could have him be there without distracting too much). The only other places I think he *might* fit are the Creation of Narnia and Night Falls on Narnia, where he might be mingled in amongst the other mythical figures. Even then, I think it’d have to be a very carefully handled scene to avoid getting too caught up in "Oh my platypus, it’s Father Christmas!" I usually listen to the podcast at work while other things are going on. I try to listen to it the day it goes up, or at least within a few days. I like the Stump a NarniaWebber questions. I wouldn’t mind seeing more of them (maybe even a special episode pitting some of the frequent hosts/guests in a trivia bowl?). When movie news is scarce, I like listening to first impressions of the books and discussions that weave in Lewis’ other writings (especially his philosophy on stories). I think Lewis dedicated one of the Ransom books to Tolkien, but I can’t recall which. I never questioned Father Christmas being in LWW, I actually saw the film before I read the books and James Cosmos has such a great presents that I just accepted it. Personally I think Father Christmas fits in naturally with all the other mythical creatures in Narnia. And he doesn’t really seem any more out of place then Bacchus and Silenus. I can understand why Father Christmas and the general mixing of mythology bothers some people like it did with Tolkien. But the mixed mythology is part of why I love Narnia, It’s a place were all the sort of things you find in fairy tale are real. FEEDBACK: How/where do you usually listen? I usually listen in one sitting as soon as I have time. What do you like and dislike about it? I like the discussion best, I don’t always agree with you guys but I like hearing other fans opinions and make me look at somethings a different way. I’m not sure if I’d call this a problem, But I feel like you guys sometimes repeat your selfs, not sure if that can be helped since by the very nature of the podcast you guys tend to talk about the same topics. What would you like to see more/less of in the future? I’d like to see more discussions about HHB, MN, and LB since you haven’t talked about them much. Thanks so much for the thoughtful feedback! I think Father Christmas should be in all Narnia movies….books, etc. He’s an intergral part of our lives… fantasy and fiction. Loved him as he gave the children their bow and arrows, their sword and shield, their life juice and dagger….He fits in. I like that he was included. I have always felt that him being there represents that all things can coincide, that the magic of Santa isn’t just confined to our world alone and that his message of "be good to one another" is no different than Aslan’s message. Both Jack and Tolkien have their places in literature and ‘genres’ and I love that they could critique (possible heatedly argue sometimes) each other’s work. "The Screwtape Letters" was dedicated to JRR Tolkien, which he wasn’t too excited about. Correct! Congrats on being the first to post the correct answer. Oh yes, feedback … I listen to NarniaWeb as soon as I get it in the morning. Usually I play audio on my computer as I sit at my desk, or put it onto iPod if I have to rush out … I wouldn’t change a lot about it, I think it’s great & I like your tone. I do sense however you might be hard pressed to find new discussion topics as you wait for the next movie. I suggest maybe deep discussions of the yet-unfilmed Narnia books (and how you’d like to see them filmed), or reporting on the many books written ABOUT the Narnia series, maybe even addressing some Narnia controversies (in your distinctly polite manner, of course!) And perhaps do phone interviews with other active Narnia/Lewis buffs around the world?? … Otherwise: DID I find Father Christmas alarming when I first encountered LWW? I was about 5 at the time, so I was good with anything. I hadn’t actually heard of Father Christmas when I first heard "The Lion, the Witch and the Wardrobe." I guess it’s because I’m American. Anyway, I was never bothered by him. I really like this podcast because I love Narnia, and it’s great hearing such well spoken fans discussing the books and the movies. I think you people have great friendly chemistry, and there’s almost always something interesting to contemplate in these podcasts. Personally, I get tired of people making jokes about the Star Wars prequels. I feel like all the obvious jokes about them have been made on the internet, and it’s beating a dead horse by now. There are movies as bad or worse that you could use as negative examples. Of course, I might just feel that way because while I can certainly understand why people find the Star Wars prequels bad or cheesey, a lot of the specific moments that people joke about I don’t think are particularly bad. Like I don’t have a problem with the line, "I hate sand." Not everyone likes sand, you know. Like I said, there are worse/ cheesier movies out there, though I understand that other people probably would be less likely to recognize references to them. If you ever do a book commentary on "The Horse and his Boy" (which I realize you probably won’t now that Rilian has a kid), I’d love to know who to email with a discussion question on it. I have a good one. I can’t remember my reaction to Father Christmas. I think I thought it was a cool thing to include. Almost like some Easter egg-like cameo. I was aware that Narnia sort of had this thing for throwing all these creatures from mythology together, so Father Christmas wasn’t all that jarring. I listen to them in one sitting if possible; either at work or when I get home, on day of release usually. I’ve actually been enjoying the podcast a lot. I think the format has been good thus far. If there isn’t movie news, you discuss something about the books, including some of the more controversial topics; which I appreciate you doing. You’ve articulated some very thoughtful responses to those controversies, obviously in support of Lewis’ work, which I think was handled very well. I enjoy the trivia quizzes at the end. Please keep those. I enjoy the podcasts where there are more members present to talk. I realize you are all growing up, busy, married, some w/ children and aren’t able to always be present. But your presences are appreciated. It’s good to hear your voices again, every time. You all have good chemistry. I think now that you all are older since the VDT movie era, you guys have obtained a different perspective on life and that is evident in your podcasts. I can’t explain it exactly, but it’s there and I enjoy it. Could just be that you’re older and/or married w/ children. That changes your perspective and priorities for sure. Other than that, I’m enjoying the podcasts very much. To be honest, it’s your guys’ enthusiasm for Narnia and your discussions on the Silver Chair movie that keeps me interested in the SC movie. I lost interest in the movie series pretty quickly after VDT. I usually listen to the podcasts the day they go up. I really enjoy the food for thought and just hearing people talk about something of mutual interest. I’d really like to hear from more Narnia-webbers on the podcast. I think bringing in some new voices, opinions and perspective would add even more interest (always keeping the original group, though). Keep up the good work! Maybe shorter time per podcast would help all of you fit this in your lives. I like what Fireberry says. Certainly other sources for discussion would be Shadowlands or other works by Lewis that fit in to the Narnia arc. Possibly compare the messages of the Screwtape Letters or the science fiction trilogy to the messages found in Narnia. Mine the Weight of Glory and C.S. Lewis’ essays for his view on education. I read Medieval Wisdom by Chris Armstrong last year which would have content you could use. Also what are the possibilities of filming other Narnia books, chapter by chapter. Filming Screwtape or Perelandra? Medival truths and imagery in the books, including explanations of the planets and beastiaries. Your hour-long episode was too long I thought for one topic. Maybe it could have been edited down or made into multiple episodes. Perhaps, when you do find time to record your conversations as 2s or all 3, do go long and evengo off-topic, gathering lots of content to do multiple podcasts. I know that’s more work for the editor, though. 20 – 30 minutes could be a goal. If I had a chance to meet The Inklings and Tolkien chose to stay home that day, I wouldn’t mind. I mean no disrespect to the man, but from the anecdotes I’ve read about him, he seemed to be overly-opinionated and a real crank. I was 5-years-old when I watched the BBC version of LWW. Being my first introduction to the story, and not yet having the mind of a film critic, his inclusion in the story was unquestioned and accepted. Coming from a household that was very anti-Santa, the line where Father Christmas acknowledges Aslan as the true King must have pleased my parents quite a bit. I usually listen to the whole podcast at once at home, but admittedly have to restart at points when I get distracted or have to do something away from the computer. And if I tried to do the dishes with the audio in the background, I would miss half of what was said. I’m a bad multi-tasker. I think a visual component, even as simple as two or three images to accompany the flow of the conversation would be a nice addition for people like me who would benefit if their eyes had a focal point as they listen. I suggest you keep the podcasts shorter; 20-30 minutes. Close to an hour is asking a lot from casual Narniaweb visitors, which we’ll be getting more of once SC production gets going. With less time, it would also taper the conversation down to avoid any talking points being repeated and basically encourage a more intentional tone. The horn could possibly represent prayer. The bow ? No clue. Same thing for the dagger. Lewis could have thrown those weapons in to foreshadow the coming battle- though I think the sword would be enough for that. I usually listen to you guys on my iPad, laying on my bed and having lunch. I really enjoy your podcasts, but maybe you guys can try and show your faces more, like talk on webcams? My theory is that Narnia was initially intended by lewis as this Otherworld that always existed alongside ours, and that from time to time people from our world and vice versa were able to crossover into each others world. Thus, Narnia is the place where all creatures or figures of myth and legend originate from. So when humans went to Narnia, the creatures they encountered would become apart of humanities various mythologies. One narniaweber mentioned that the half bull half man in LWW(not the minotaur)is a creature from Babylonian mythology. Father Christmas’ appearance in LWW is like Bacchus and and Silenus’ appearance in PC. They were both figures from our legends found to be real in that world. Of course the notion that Narnia always existing parallel to our world was changed with Magician’s Nephew. I actually wished CS Lewis had kept to that initial idea. It would make nore sense. 1. When I first saw TLTWATW, I was about 6-8 so I don’t really remember my initial reaction to Father Christmas (but I’ll just call him santa), other than the fact he didn’t have his usual clothing, and other than that he didn’t really feel out of place. 3. I really enjoy these podcasts! There are times where you guys could be a bit nitpicky like w/ that line about the children santa said, but as long as it doesn’t get too out of hand, I’m ok with it. I usually listen on my computer when I get home from school and browse the comments section, look around on twitter or eat some snacks. Tolkien is wrong and wishes he had CS Lewis ability to write. Sounds like he was jealous. 1. Since I did not grow up on thinking that Father Christmas was real, Narnia was one of my first introductions of Father Christmas at all in a story. So, I think I thought really nothing of it. 2. Last Battle is my guess. But, I really have no clue. 3. I love listening to the podcast. I listen to it whenever it comes out. Sometimes, I have it play in the background and other times I sit on the couch and listen to it stopping everything else I am doing. I love listening to debates or discussing about things I care about, so I would love to hear more podcasts in the future. On Father Christmas being in future Narnia movies, I really think he might be fine in Silver Chair but, I am not sure what other books he could even show up in. Actually, as I was writing I thought up a way he could show up in the Horse and His Boy. They could have the movie skip to winter and have a wedding scene between Shasta and Aravis. Father Christmas could have been invited to the wedding. It’s interesting that some commentators think the podcasts should be half an hour. I think they should all be at least an hour or a little less than that. My final answer: The Screwtape Letters. Like ‘narnia fan 7’ I saw the movie of LWW first. Therefore, I was not surprised by FC. I have since read the series many times, and the only thing that still surprises me is Lucy being told at the end of VDT that she is now too old from Narnia. How can someone be too old for Narnia? The dedication of LWW to Lucy Barfield says otherwise. I am retired, and I do not think that I am too old for Narnia. IMHO, this could make a good discussion. I have been known to create my own "truths" about Narnia. Was the dedication of "The Screwtape Letters" to Tolkien meant to be an honor or a tweak? Which character, if any, represents Tolkien? 😉 The Inklings often roasted each other. The length of the podcast should be what it takes to cover the topic. One should never ramble. I hope you continue. I like it when the three of you (Glumpuddle, Rilian and Gymfan) are together. Others are also good. You can pick topics from all over the series. I can think of some great topics from HHB. Obviously, it is best when you disagree. This is one other my favorite podcasts. I always listen. I would have to disagree with Tolkien in that I think it is the author’s right to mix mythology. It adds variety to the book and makes it interesting– especially for a younger audience (including children). I liked Father Christmas in Narnia (no artificial commercial Santa Claus). I think he belonged in Narnia. The Disney movie got this mostly right– except of course for not giving Aslan credit for his seasonal power. And I would have liked it better if the children were moved by his name and showed their true feelings toward him as they did in the book. I love these podcasts. I listen to them usually while drawing (shameless plug, check my art out on instagram, search my name, lots of fantasy/whimsy). I find myself wanting to get in on the conversation with you guys too, and I’m usually quite intrigued or enlightened by what Brian (Glumpuddle) has to say. On the Father Christmas debacle, I found myself resonating with the producer on the commentary clip, in relation to my memories of first reading that scene as a kid. I didn’t know who "Father Christmas" was (being an American), and by the time he gave the Pevensies their gifts and I caught on, I wasn’t too put off by his appearance. I think the way Lewis introduces him is artful, which was an excellent point made in this episode. Truly, the greater reality that Narnia is an amalgamation of transcultural myths pretty easily dispels any legitimate criticism of Father Christmas’s arrival in Narnia. Narnia is a land of true-myths. So Father Christmas pops in, so what? It’s fun. I love Tolkien, I think he was brilliant, but he was a crank. Narnia wasn’t his creation, it was his friend’s. He had no personal stake in its designs. That would be an interesting episode, to look at Lewis and Tolkien’s friendship. Lots of hot and cold stuff there. My only minor criticism of the podcast is as follows. I think Glumpuddle does a superb job in his presentation, flow, and research for each episode. The other hosts are fine, and I don’t want to sound personal or mean-spirited, but oftentimes I grow tired or impatient with the way they interact in the conversation. There’s a sort of clumsy, "I haven’t thought too much about this so I’m going to gather my thoughts as we record and take a long time to express them" process to the way they talk, at times. Or perhaps they have thought deeply about the topic at hand, but they’re trying too hard to speak their mind perfectly. I don’t know, but it stagnates the discussion. Don’t get me wrong, I love that you guys have multiple people on board, usually, and I love hearing you converse, but I get tired of all the, "Um…what’s the exact right way to say this…yeah…I don’t know…" Also, every now and then I feel like the conversation is sidetracked with what is intended to be banter, but its result (at least for me) is that I am confused or unenthused by the jokes. I have no specific examples, there are just interruptions sometimes that distract from the reason I’m listening in the first place. Humor’s great, it’s just not always perfectly implemented, and I think I can hear this type of derailment in the voice of some of the podcasters when they’re not sure how to react to their co-hosts’ non sequiturs—or aren’t sure how to get back on topic. I hope my comments makes sense, and aren’t unfair. I mean no harm. I love this book series and love that you’ve been tackling more controversial topics lately. Keep it up, keep the material interesting, keep the conversation moving. Great work over all. I know it takes a lot of time and effort to make these. Keep it up! 1. My first reaction to Father Christmas was in the Disney movie when I was about 8 or 9 years old. I really love how they did him there; yes, much more than how Mr. Lewis describes him. My family has never been a "Santa Claus family," and especially now that I’m older I think that if he had been stereotypically Santa, it would be a big turnoff for me. As it is, he just seems like a kind, jolly old grandpa. My reaction then was, I think mostly interest in how his costume and all was designed, as I’d never seen that interpretation before. He’s me Saint Nick there. I listened to a paraphrase of LWW in the dark in about 1956, but I don’t remember hearing all the story. When I finally read the story my reaction was one of relief, that the wolves following the Pevensies and the Beavers, let alone the Witch in her sleigh, had not caught them and that the sleigh belonged to Father Christmas, instead. When everyone was expecting horror, someone known as being benign had turned up, able to equip them for what was to come. When I listen to the podcast it is usually at least 24 hours after the board has indicated it has been posted, eg Monday 11th December, which is usually 12 December, here. Right now it is Wednesday afternoon, whatever it is where the Talking Beasts are now, let alone where they were when the podcast was posted. Normally I listen of an afternoon or evening, and it is a treat to save up until then. Oh yes, I do have one request for the podcast: Could you please indicate whose voice is speaking a little more? That way it helps people more whose hearing isn’t what it used to be. I was seven when I first read the books, so I found it perfectly natural that Father Christmas was the first sign that the winter without Christmas was ending. And just in case no one has ever heard this (I hadn’t until I was doing research on the subject): According to one of Lewis’ friends and biographers, one time when Tolkien was being particularly adamant that the mixed mythologies shouldn’t be in Narnia, Lewis "argued that they existed happily together in our minds in real life." Tolkien’s reply was, "Not in mine, or at least not at the same time." But I agree strongly with the sentiment that Lewis expressed. As a child one has the remarkable capability to construct worlds that contain all our favority imaginary (and sometimes real but unavailable) characters and interact with them. In many ways, Narnia functions as just such a dream world, but with the added bonus of feeling more valid because it has boundaries and rules made by someone else and not just our own arbitrary desires. I love that so many of my favorite things and people are there for me to visit whenever I want to, especially Father Christmas, the loss of belief in whom seemed to be the great first death knell of childhood looking back. As for listening, for me it varies, but I love when the discussion becomes particularly literary and pulls in information from other writings of C.S. Lewis to interpret the Chronicles. But anyway I can interact with other big Lewis fanatics is a plus for me! I forgot to add, the above quotes are from the book Jack: A Life of C.S. Lewis by George Sayer, page 313. Oh wow, I really appreciate that anecdote and your thoughts on Lewis’s view, LadyBessofWistry! Excellent observation about the connection between childhood dream worlds and Narnia. Are you sure this quote is correct? The quote is what George Sayer wrote from his memory…it is published and I have no reason to question it and have seen it quoted in other published books. Sayer was first a student of Lewis’, and later became one of his close confidantes, and was eventually a trustee of the Lewis estate. 2. No idea, but I was surprised to hear Tolkien didn’t enjoy Narnia. (I think it’s because Tolkein may have been a ‘surface reader’ and didn’t understand the heart of the stories, which is fine if you’re reading Harry Potter, but a bit of a problem when reading Narnia). The screwtape letters were dedicated to JRR Tolkien. 1) As the youngest of four, I don’t remember when I first heard/read the Narnia books, so Father Christmas has always seemed to fit in nicely for me. I think his tea trays are a wonderful way to point out the growth of hope in Narnia as well as the true character of the witch. 3) I almost always listen to the podcasts when I’m at work doing stuff on the computer that doesn’t take too much thinking. I would love to have them weekly, but I know that’s not realistic since you guys are all busy and there’s not always news to go over in great, glorious, Narniawebber detail. I don’t have any major suggestions, except that it might be fun to have a little snippet every time like the C. S. Lewis minute but focusing on something like a different type of creature or a different place in Narnia. Similar to Forrest above, I also get a bit irritated with other hosts on the Podcast at times. (I liked when Glumpuddle and Rilian would talk. They have good chemistry.) I liked this episode because it was mainly Glumpuddle talking and occasionally getting a brief piece of commentary from others. Also, this is a completely personal opinion, but there are sometimes people with grating voices on the podcast… I actually stopped listening to it at one point because of it, but I won’t mention any names… :S Sorry, it’s just one of those things. The Screwotape Letters. Also as a kid I never really had an issue with Father Christmas being there. I just took it as Well of course he’s here. Why not? It is a magical world he’s a magical person. Not that I don’t see the issues now but I don’t care. The theory I’ve had for a while about Father Christmas is the same as that of why there are "gods" that show up in the stories, for example the river god and Bacchus and Silenus. If they were real and were not evil, they would give glory to their Creator and King Aslan, no matter how powerful or famous they were. It would be a bit like Optimus Prime showing up shortly after the Narnian group has climbed up the waterfall in The Last Battle, excitedly telling them what the Hulk had told him, which he had heard from Superman earlier, that Aslan the great King was "further up and further in." (Hopefully the second half of this comment isn’t Narnian blasphemy and doesn’t get too much hate). What was my first reaction when Father Christmas appeared? I saw the BBC TV adaptation when I was 5, and, in my own callous 5-year-old way, I felt pretty delighted to see him. Did he seem out of place? The problem is that people get Father Christmas mixed up with Santa Claus. Santa Claus is a Christmas caricature. Father Christmas is uniquely English tradition. As far as the trivia question about JRR Tolkien. I knew it wasn’t any of the Narnia books, so I thought it was one of the Space trilogy books because Tolkien inspired much of what was in those books. But it was The Screwtape Letters. 1. Not at all! I thought it was actually really clever of Lewis. Father Christmas seemed a natural fit for Narnia. 3. I usually listen while walking. As for feedback, the original hosts are good, but you guys have the same opinion on the majority of things. Maybe some new perspectives would help balance or help the conversation flow a bit better. … on the books and movies, and his passion for the books is enjoyable. Rillian is also a favorite. I will also add, I really enjoyed the Wonder Woman episode. I would enjoy hearing more discussions around other stories and art from Narniawebbers. And it would be nice to have a socîal media campaign before The Silver Chair is release, to help spread the word about the movie to get more viewers, so more films can be made. Hey, I just rekindled my love for Narnia again, and came across the you tube channel Glumpuddle and was so amazed that there are other Narnia lovers out there who has deep thoughts into the theory of Narnia and such. I just listened to my first podcast a few hours ago and this is now my 2nd one. Thanks for doing these podcasts, I really love them! and I’m not one to even listen to podcasts in general. I find it so interesting. As for my reaction to Father Christmas, as a kid I was initially confused of why he was there but after didn’t really pay attention to it. A child’s mind is amazing where they can invent things out of thin air and literally believe in them. I guess it adds to the fantasy of Narnia and the imagination that ones get when in childhood, Which most of us lose sadly in adulthood. Sooo when’s the next podcast? We are going through this helpful feedback and coming up with a plan! Sorry, not sure exactly when we’ll be back. Hopefully within the next month. Thanks for your enthusiasm! Currently considering doing a chapter-by-chapter commentary of The Horse and His Boy (or MN or LB). For the past few years (and recently), listeners have expressed interest in exploring the last 3 books we haven’t given much attention to. One of the most challenging things with these episodes is coming up with a way to involve the listeners. Otherwise, it’s just a few nerds rambling on haha. Any suggestions would be appreciated! I supportive of every character in Narnia including Father Christmas, Bacchus and Silenus. These three characters show that Lewis was willing to expand the horizons of the readers. I like that Lewis was willing to challenge many secular and Christian norms that many people would not generally not understand. One day, Lewis and a friend were walking down the road and came upon a street person who reached out to them for help. While his friend kept walking, Lewis stopped and proceeded to empty his wallet. When they resumed their journey, his friend asked, "What are you doing giving him your money like that? Don’t you know he’s just going to go squander all that on ale?" Lewis paused and replied, "That’s all I was going to do with it." Also, I listen on Stitcher. Sometimes I listen to the whole thing and sometimes in parts. I like this podcast as it is. The main content is great and so is the Narnia Minute.